NEW YORK -- Click a window to hear audio. Click upper corner to watch full screen. WABC-TV is proud to be the English TV broadcast partner for this event. 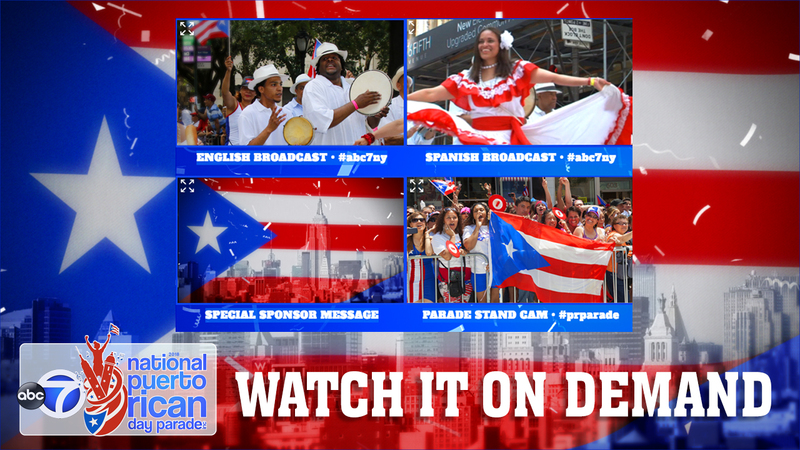 This 2018 National Puerto Rican Day Parade is led by the award-winning actor Esaí Morales as Grand Marshal. Born in Brooklyn, Morales' screen credits include roles in films like "La Bamba" and "My Family/Mi Familia", as well as television series like "Chicago PD," "Criminal Minds: Beyond Borders" and "Ozark." Over his 35-year career, Morales has sought to challenge the stereotypical portrayal of Latinos in television and film, and he now serves on the national board for SAG-AFTRA. You can learn more about this year's parade by visiting nprdpinc.org.